A man has been fined after he breached a restraining order by contacting his former partner who had gone into hiding after he had been attacked. 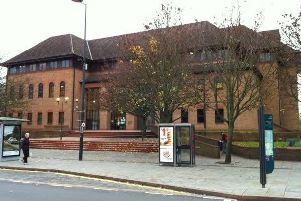 Chesterfield magistrates’ court heard on Thursday, July 12, how Scott Brazier, 47, of Hazelby Road, Creswell, had previously been sentenced for assaulting the complainant in September, last year, to a community order with a restraining order. But Brazier contacted his ex-partner with a Facebook message on January 11 after the complainant had moved away from the area. Prosecuting solicitor Sarah Haslam said: “The complainant moved from this area of the country so the defendant could not find out where he is living. He said he is in fear of this defendant. The complainant deactivated the account straight away and contacted the police because he was scared the defendant might turn up out of the blue. Brazier pleaded guilty to contacting his former partner by Facebook which he was prohibited from doing by a restraining order. Defence solicitor Steve Brint said Brazier only made contact because he knew the complainant was having financial difficulties and he had not informed the people he had loans with that he had moved. Mr Brint claimed Brazier was asking for the restraining order to be removed so he could contact the complainant and offer to pay some of the debt he had incurred. Mr Brint added that the Facebook message stated: “Okay, where do I start? Going to court to get the restraining order dropped as I have tried to do. “I know you are in financial trouble. “I have had phone calls and I have a message saying you need help fast. Magistrates fined Brazier £126 and ordered him to pay £85 costs and a £30 victim surcharge. The restraining order which is due to expire in March, 2019, was also extended until March, 2022.